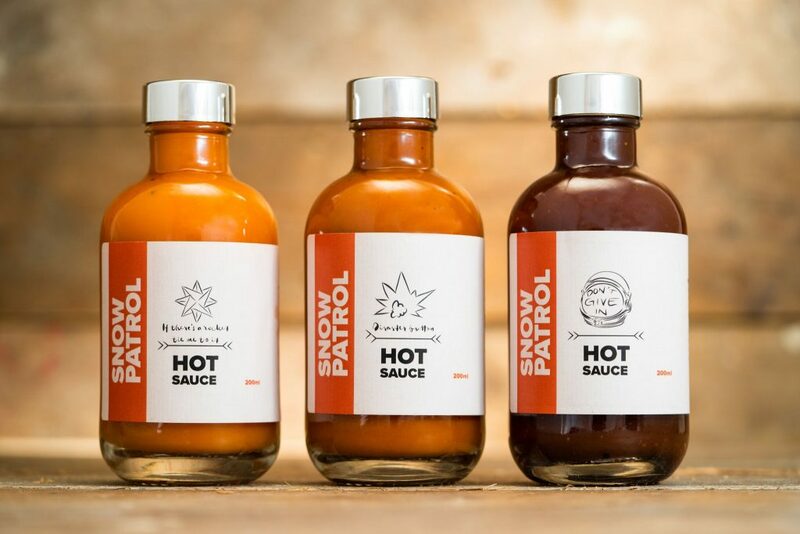 NORTHERN Ireland hot sauce company, Rock A Doodle Do – Belfast Hot Sauce, will set the world alight with its latest range of special Snow Patrol hot sauces guaranteed to rock your taste palette. Collaborating with the band the range links in with song titles and will only be available at the merch stands of Snow Patrol shows with all proceeds going to charity. Rock A Doodle Do has been making a name for itself with the soaring taste sensations of rock themed hot sauces that have your tongue ready to lift off in ecstasy. 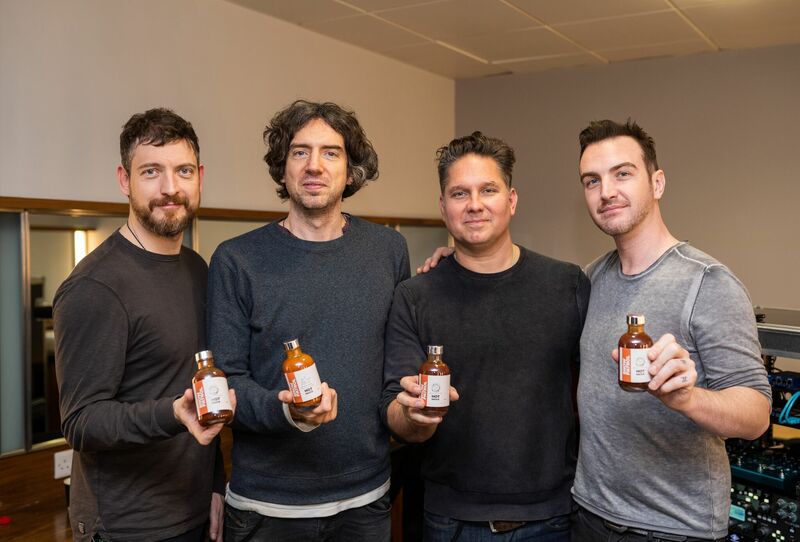 The production of the Snow Patrol hot sauces represents a synergy between the band and the charity, Music For All, that has a patron in the shape of Jools Holland and has ambassadors such as Rick Astley, Howard Jones, Rick Wakeman and many other musical luminaries. Owner Dave Kernaghan said it was an opportunity to give something back together with one of Northern Ireland’s leading bands. “It was great fun to look at Snow Patrol songs and tie in hot sauce ranges,” he said. “And, these are guaranteed to spice up every meal. Snow Patrol’s Jonny Quinn said that Rock A Doodle Do’s hot sauces have paved a way with its unique tastes and use of Northern Ireland products. Paul McManus, CEO of Music For All said this was a fun way to raise money – and get some great hot sauces to spice up any meal. Dave has been making his own hot sauces for almost 30 years but took the plunge in 2015 to launch the Rock A Doodle Do range based on his love of rock music and after three years has customers across the globe. Dave has been constantly revising his recipes since he developed his initial concoction. “I named my first hot sauce after the first record I bought, Iron Maiden’s Can I Play With Madness and called it ‘Can I Play with Mangos’ a Mango Habanero based hot sauce that was relatively mild but full of flavour. Dave has been constantly refining the Rock A Doodle Do range – including the devilish Fear The Reaper Extreme – including one based on the Irish legends of The Pooka and The Banshee. Using flavours and ingredients from Belfast’s St George’s Market, smoked Salt and Pepper from The North Coast Smoke House, and Farmageddon’s Golden Pale Ale, among other Northern Ireland products to produce Rock A Doodle Do’s range. They also make custom batches that come in premium glass Skull Bottles, we have made small custom batches for wedding favours, we sell gift boxes, and fresh/dried chillies too. If there’s a Rocket, tie me to it – A delicious Ghost chilli sauce that combines one of the hottest chillies in the world, the Ghost chilli with peach, lime, and a locally produced Golden pale ale to create a sauce that perfectly balances heat and flavour. Don’t Give In – A hot BBQ sauce that combines the Trinidad Scorpion Chilli with a locally produced Whiskey to create an extra hot BBQ sauce. Disaster Button – This is a sauce for the real chilli lovers out there. We created an extra, extra hot chilli sauce that uses the hottest chilli in the world, the Carolina Reaper and combined it with lime, mango, and maple syrup to make a ridiculously hot sauce that tastes delicious.